AMC Movie Theaters are a classic staple in entertainment, providing films to the movie-loving public since 1920. You can find AMC in 30 states and Washington, D.C. International locations include Canada, Mexico, France, the U.K. and Hong Kong. The company has more than 5,000 screens in more than 350 theaters. In 2007, 240 million moviegoers enjoyed a movie at an AMC Theater. AMC strives to be a leader in the movie industry and the chain is proud of several of its innovations. For instance, the company was the first to introduce the armrest cupholder, giving viewers a more convenient place to stow their beverages. Looking to improve theater seats even more, in 1995, they introduced "LoveSeat" seating. By making armrests that fold up, patrons could now get a little closer while enjoying a film. Seats in some theaters also feature lounger styling for even more comfort. 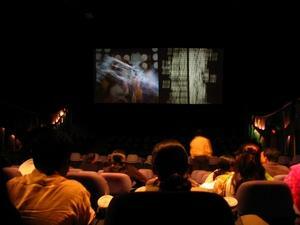 The chain was also instrumental in the creation of two big names in online ticketing, MovieTickets.com and Fandango, allowing viewers to conveniently buy movie tickets online before leaving home. AMC introduced the Megaplex concept in 1995 at The Grand 24 in Dallas, Texas. This theater not only included an unprecedented number of screens, it also featured a more luxurious environment. More screens mean more movies, more showtimes, and the ability to keep titles in theaters longer. In fact, there's more of just about everything in the theater, with additional concession areas and ticket booths as well. The idea has proven so popular that today, 3,600 of the chain's total screens reside in a megaplex. Concessions Discounts - What's a movie without popcorn? Clip's Picks is a selection of bargain concession products that essentially allows you to create your own snack combo. A.M. Cinema - Watch a movie before noon on Fridays, Saturdays, Sundays and holidays and enjoy a discounted ticket price. Silence is Golden - This initiative aims to provide a distraction-free environment for all moviegoers. Workers monitor individual auditoriums to ensure a quiet atmosphere. The large-view map on the Theater Locator page gives an idea of the scope of the chain. However, despite this large span, if you're a North American customer, finding the nearest theater is as simple as typing in your zip code or postal code. Purchase an AMC Entertainment Card, the theater's gift card good for movie tickets and concession fare, and check the balance on an existing card. Find showtimes through the MovieWatcher service. This site also contains a more general list of current and upcoming releases, ratings information, and accessibility options such as Closed Caption and Descriptive Video for the hearing and visually impaired. Customers can order large quantities of tickets for employee reward programs or holiday gifts. View career opportunities with the company. Whether you're interested in working on a theater crew, managing a location, or working in the home office, you can find out more about job titles and apply online. With so many theaters and multiple screens at each one, it won't be difficult finding a movie to watch. Buy some popcorn, plop down in a comfortable seat, and spend a couple of hours relaxing in front of the big screen.